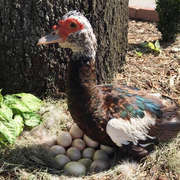 "I was sitting there, doing all my bills, and all of a sudden I hear this 'quack quack.'" A Washington man noticed a new addition to his home on John Sam Lake recently. "I was sitting there, doing all my bills, with all these file folders laid out, working on my computer," James Prettyman told The Dodo, "and all of a sudden I hear this 'quack quack.'" 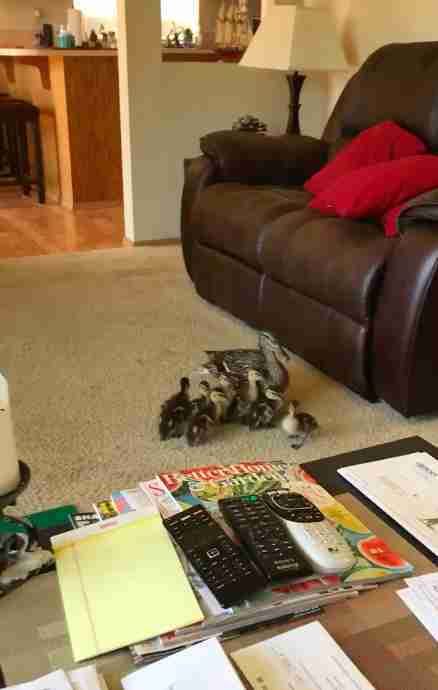 He looked just over the coffee table, where a stack of magazines topped with Better Homes & Gardens lay, and noticed an entire family of ducks just sitting there. Whether the presence of the ducks was an improvement to the room was hard to say — while they certainly lent a natural feeling to the space, they obviously did not belong there. 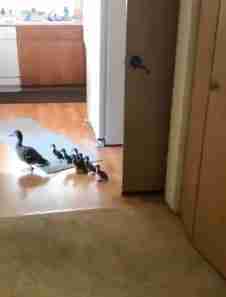 Prettyman filmed the feathered family as he got up and tried to usher them out the open front door, where they had let themselves in. The ducks had something else in mind. 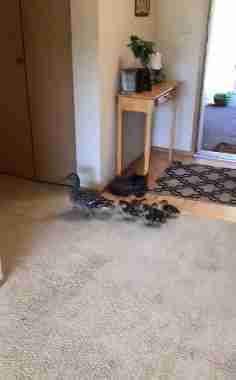 The mother duck turned left, and her seven ducklings followed her down the hallway toward the kitchen and then into the dining room, chirping to each other all the way. Then, seeing the sliding glass door open leading to the sunny backyard, they figured they'd leave. They meandered out onto the deck, hopped down onto the path, and walked across the yard. 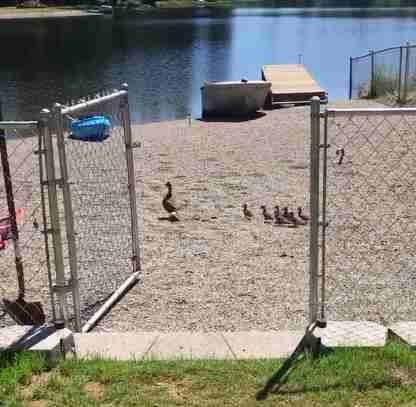 The ducklings were tiny enough to squeeze through the little space between the fence and the gate, leaving the mom duck separated for a moment, so Prettyman helped her out in a gentlemanly way, opening the door for her. The mother duck exited, holding her head high, and joined her ducklings on the dock. "How many chances do you have to have nature come through your home?" Tom Prettyman, James' father, told The Dodo. "So cool he recorded it all."